But working alone? Not so much. I recently attended my first Jelly, a network of fortnightly ‘work together’ or coworking events. “[To] provide chairs and sofas, wireless internet, and interesting people to talk to, collaborate with, and bounce ideas off of”. Whether you work solo, remotely or in full-time employment, coworking offers a change of pace as much as a change of scenery. The atmosphere at Jellys is deliberately casual and chatty – perhaps not the ideal place for a hard days GTD. Instead, the events offer the chance to meet some interesting faces and throw new ideas around. For myself and those that I met, the opportunities more than compensate for a little lost productivity. Last week’s Berlin Jelly was predictably popular with fellow internet geeks. Most were web designers or developers, reflecting common expat vocations in a city where local employment is elusive. The event was hosted by Robin Slomkowski, a developer on the Flock browser. Coworking events in other cities, like London’s Tuttle Club – in my diary for my return to the Big Smoke – attract a broader crowd, from professional musicians to marketing consultants. Others specialise in a particular field, like art. Jelly events take place in dozens of cities around the world, as listed in the Jelly wiki. 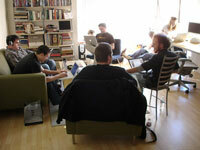 The coworking wiki lists dozens more non-Jelly events worldwide. Interested in learning more? Watch Amit’s video introduction to Jelly. Been to a Jelly or coworking event elsewhere? I’d love to hear your experiences. Thanks to Mokolabs for the photo of a San Diego Jelly.